WASHINGTON (CNN) - The cast and crew of "Hamilton" didn't throw away their shot to perform for one of the former presidents of the United States in his home state. The touring production in Houston made a stop at former President George H.W. Bush's office for a performance on Tuesday in an effort to lift the spirits of the former commander in chief. "A complete joy to welcome the 'HamFam' --- the cast and crew of @HamiltonMusical --- to our Houston office for a special performance I will never forget. History never sounded so powerful," Bush wrote in a tweet, accompanied by two photos of the day's events. The 93-year-old former president was recently in the hospital battling an infection that led to sepsis, which happened the day after the funeral last month for his wife of 73 years, former first lady Barbara Bush. Bush revealed several years ago he suffers from a form of Parkinson's disease, which has left him unable to walk, so he gets around either in a wheelchair or a scooter. According to Bush's spokesman, Jim McGrath, the 41st President was very taken with the performance of excerpts from the show, as well as with the cast, and he wants to try to see the full production before its Houston run ends Sunday. He gave Tuesday's performance the presidential seal of approval, declaring it "powerful and wonderful," McGrath said. Bush, famous for wearing themed socks, does not have any Hamilton socks -- yet -- so he was sporting a pair of Navy socks with anchors on them, McGrath told CNN. 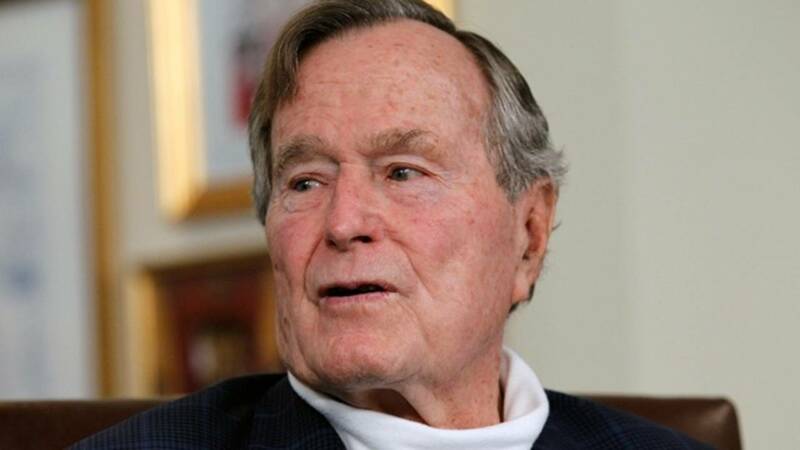 As for how Bush is feeling after his hospitalization and the loss of his wife, McGrath said he is doing great, appearing sharp, happy and looking forward to hopefully seeing the full performance of the show before heading to his summer home in Kennebunkport, Maine, next week. The musical depicts the life of American Founding Father Alexander Hamilton and incorporates hip-hop, R&B and pop music and a cast of nonwhite actors as the Founding Fathers and other key historical figures. "Hamilton" won the Tony Award for best musical in 2016 and has been been the toughest ticket to get since it premiered in late 2015. The musical is touring in Houston through this weekend. The cast and crew of "Hamilton" have not been shy about putting their political beliefs on display. Following a performance of the show on November 18, 2016, when then-Vice President-elect Mike Pence was in the audience, actor Brandon Dixon, who plays Aaron Burr in the show, addressed Pence by thanking him for attending the play and saying, "We hope you will hear us out." Pence later said he "wasn't offended" by the message of the cast, but then-President-elect Donald Trump took to Twitter to express his own point of view. "The cast and producers of Hamilton, which I hear is highly overrated, should immediately apologize to Mike Pence for their terrible behavior," Trump tweeted the day after the interaction.